The CoverCat 452 is the largest most powerful plural component spray system made by CoverCat and has no equal in capacity or capability. 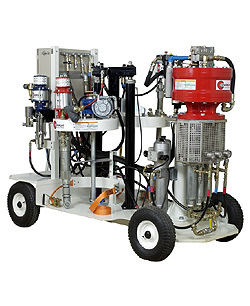 A high volume, heavy duty spray system with cart mounted 55 Gallon (200litre) Feed drums. The System is regularly used in Shipyards and supplies up to 6 spray guns on indiviual hoses to 500feet (150 meters) from the unit. It has been extensively employed in Shipyards in the USA with great effect. The heavy duty cart with lift frame option is highly portable. It is a self contained unit requiring only air and power supplies to enable operation. Operators manual and guidance notes.